Like many of us, I am often attracted to some neat prototype that happened to catch my eye. It’s the “shiny new toy” syndrome, maybe, but let’s call it “Frank’s Distractions.” I’ll present some of those on occasion here on the blog. Some of these may end up as resin models but many will remain the shiny distractions they are. Here’s a tank car that caught my interest. Click on any image here to review a larger size. I found this car from a link posted on the Steam Era Freight Car YahooGroup. The tank car is what I’m calling a GATX Type 22, 10,000 gallon car. This car has a new full platform but they left the support for the old platform on the bands. The existing running boards are still wood while the new platform has an open grate. While it’s not very clear in the photo, it seems the car was reweighed in 1949. The 1943 ORER NMRA reprint lists UOCX 10000-10545 as 10,000 gallon cars. If this is a continuous series of cars, then it is the bulk of the 1943 UOCX fleet. A 1926 ORER lists UOCX 10000-10407 as 10,000 gallon cars. 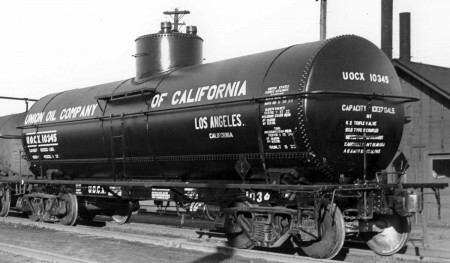 If this is a continuous number series, these tank cars would be two-thirds of the 1926 UOCX fleet. While these listings seem to be a continuous series of tank cars, these number series may not contain tank cars all built to the same design. private car listings can be squirrely like that. The GATX Type 22 tank cars would be a “Someday” kit. There are just too many other items ahead of it right now. The model pictured above is a kitbash of an InterMountain tank. The only resin parts are the tank saddles and the running board/brake supports. If this GATX Type 22 goes into production, it will need to be a full resin kit due to the unavailability of InterMountain kits. The car is modeled from plans and measurements from a prototype car at the Monticello Railroad Museum. It’s GATX 7297 which was built 12-25. I hope you have enjoyed this shiny new toy! It’s just one of many personal distractions.